Meet my cousins: Carolyn and Agnes. Before I even get started in this recipe for Potato Salad, I’d like to introduce you to two of my favorite cousins. That’s Carolyn in the back, and her older sister Agnes in the front of the photo above. Age wise, I’m somewhere in between these two. We played together as youngsters, and going to their house was one of my favorite places. They had two brothers around my age, and getting together with them was always an adventure. Carolyn and I seem to always be competing against each other in the “Dessert” category at the Cousins Reunions we have once a year. I might have defeated her a time or two, but she has done the same to me. She makes some really awesome cakes. For many years, I’ve always enjoyed the Potato Salad that Agnes brings to our Reunions. To me, hers is the most like what Mama always made, and I can’t help but dig into the big bowls that she always prepares. 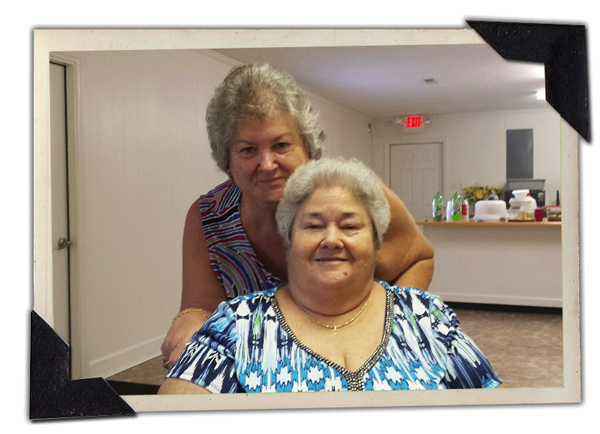 At our Cousins Reunion last year, (2016) I finally cornered Agnes and asked her to tell me how she made the Potato Salad that always brings back great memories for me. I’d been wanting to ask for sometime, but just never got one of those “around to it” moments to ask her. I pulled out my cellphone, turned on the voice recorder, and had her go through it step-by-step. She didn’t have measurements of course, so I had to come up with those on my own. Like so many other dishes, Potato Salad is one of those dishes that determines just how good of a “Southern Cook” you really are. Naturally, I always thought Mama’s was the best. When the big Family Reunion decided to publish a family cookbook of recipes back in 1999, Potato Salad like this wasn’t included. All the “sisters” from my moms side of the family, knew how to make it, and I guess they just never considered that it was one of the recipes that needed to be included in the cookbook. That’s so sad to me, because we have lost a lot of good old recipes that way. As mentioned, I always thought Mama made the best potato salad. I just never tried to make it while she was still with us, and I regret that to this day. Her homemade spaghetti recipe still eludes me. Sunday dinner with all the family gathered around that big oval table almost always had a large bowl of Mama’s homemade Potato Salad. Of course, to me, what made hers special was her homemade sweet pickles that she always would put in it. There was just something special about her pickles. I do hope you’ll give it a try, and of course, I do hope you like it as much as I do. I think Agnes makes about 10 pounds at a time for the Cousins Reunion each year. I’ve made five pounds in the recipe below. You could easily half that, but why would you want to? 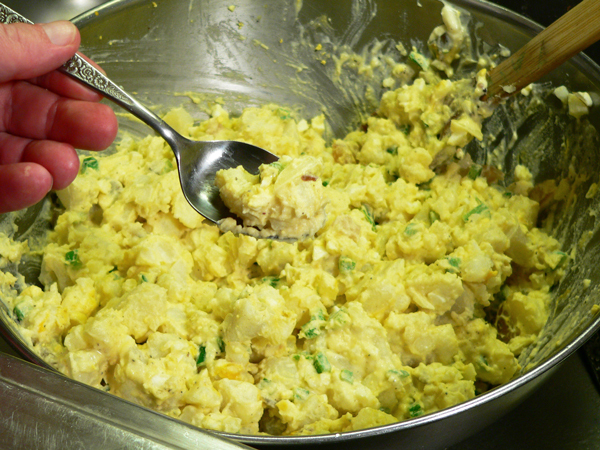 Potato Salad needs to be made in large batches because you intend to share it with lots of people. It’s just that good. So, if you’re ready to give one of our family favorites a try, let’s get in the kitchen, boil some water, and… Let’s Get Cooking! 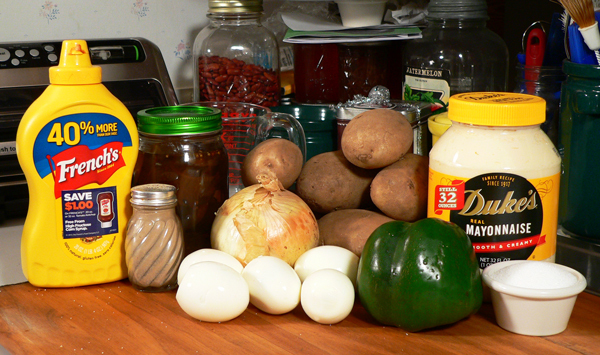 Southern Style Potato Salad Recipe: You’ll need these ingredients. 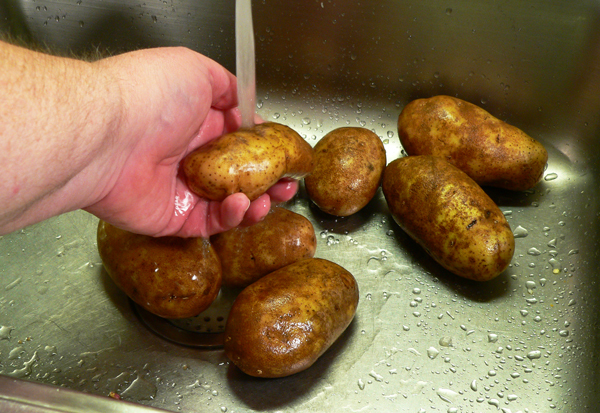 Rinse the potatoes under cold running water. I like to always wash my vegetables before using them. Yes, we’re going to peel them and discard the peelings, but I just feel better knowing I’ve rinsed the dirt and anything else off of them first. It’s a personal thing I reckon. Smile. I’ve never enjoyed peeling potatoes for some reason. 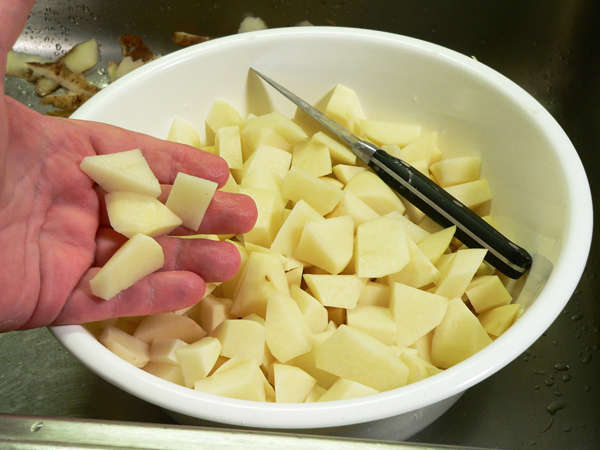 Whether you use a paring knife or a potato peeler, just be careful. Cut them into cubes or chunks about 3/4 of a inch in size. Mama always held the potatoes in her hands as she sliced them. She’d end up cutting them into all different shapes by the time she was finished. If you need, or prefer to, just lay them on a cutting board and cut them up that way. Either way will work just as well. You DO want to be consistent with the size of the pieces. Keeping them all close to the same size will help them cook more evenly. Really small pieces will break up and become mashed potatoes whether you want them to or not, so go for larger, but even sized pieces. 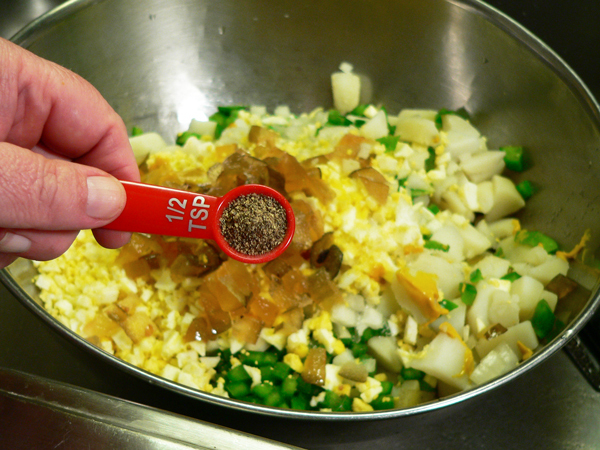 Place a large sauce pot, filled about 3/4ths full with water, on your stove top. Turn the heat to about Medium-High and bring the water to a low boil. 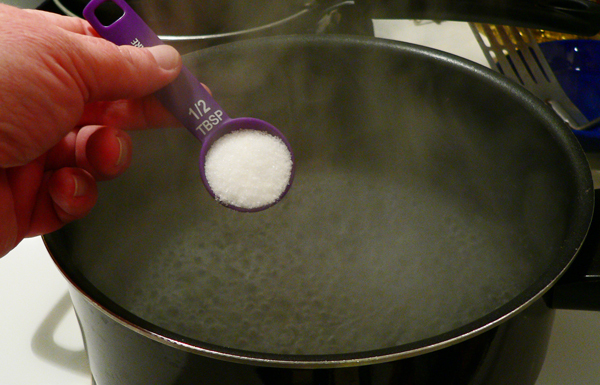 Add about 1/2 Tablespoon of Salt to the water. 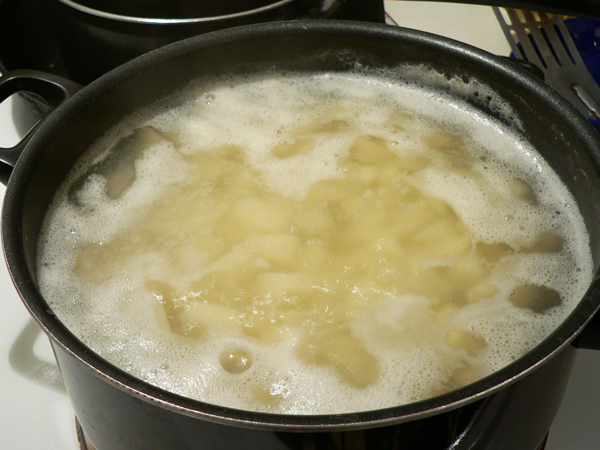 When the water starts to boil, carefully add all of the potatoes. 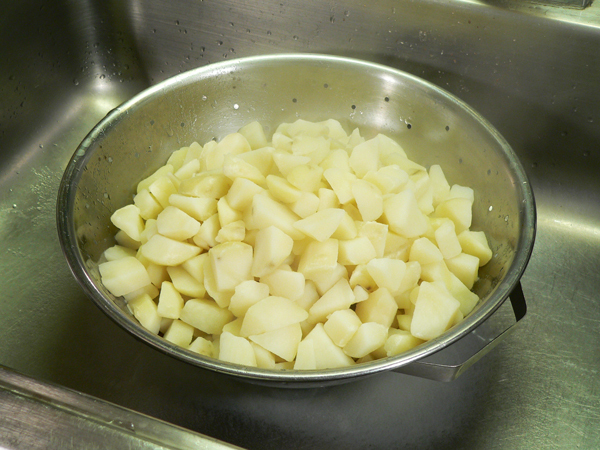 I had to scoop out some of the water once I added the potatoes, the pot almost ran over. Simmer the potatoes just to the point of where they are tender. Okay, this is the only tricky part. You want the potatoes to reach just the point to where they are tender, but not falling apart. If they get too soft, you’ll end up making mashed potatoes. If they don’t cook long enough, you’ll be biting into hard, raw tasting bits of potatoes. You really should be tasting the larger chunks of potatoes after a few minutes. See if you can taste the salt in them, if not, add a little more salt. 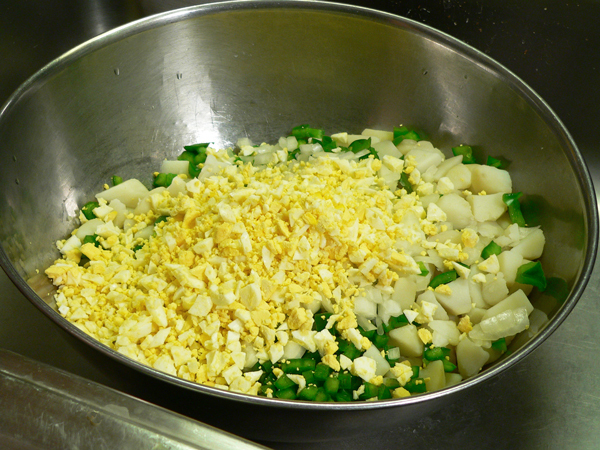 This is the time the salt will absorb best into the potatoes for added flavor. If you’ll taste some of the larger pieces for softness, then the smaller pieces will take care of themselves. When you think the larger pieces need “about one or two more minutes,” take them up. They will continue to cook after you drain them. 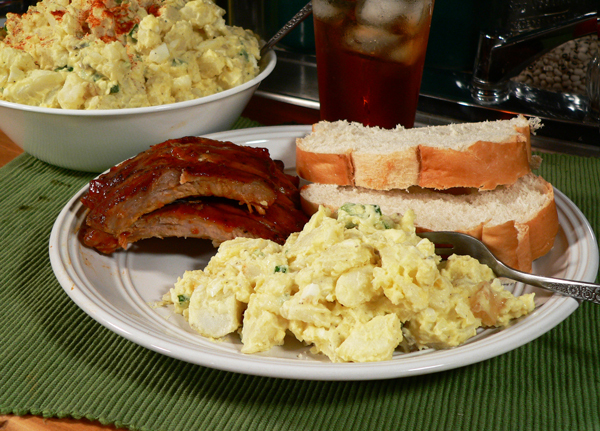 It may take you a few times, but get this part right, and you’ll be on the track to making some great potato salad. Empty your potatoes into a colander, and let them drain. 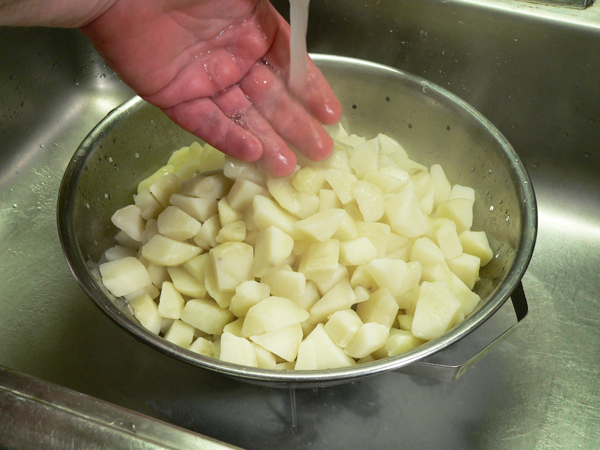 I like to let cold running water flow gently over the potatoes to help stop the cooking process even quicker. 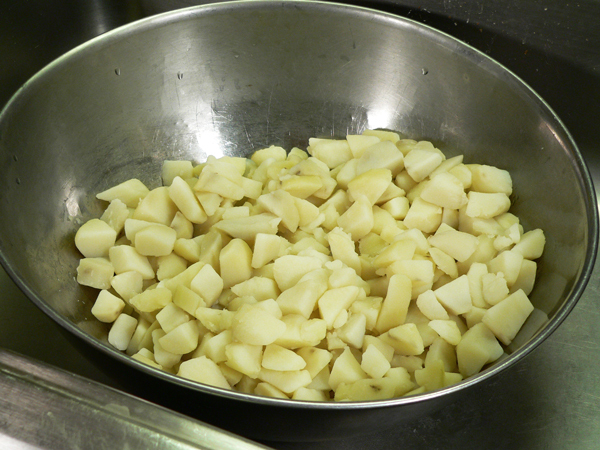 Place the drained potatoes in a large mixing bowl. Place the uncovered bowl in your refrigerator to cool down while you prep the other vegetables. 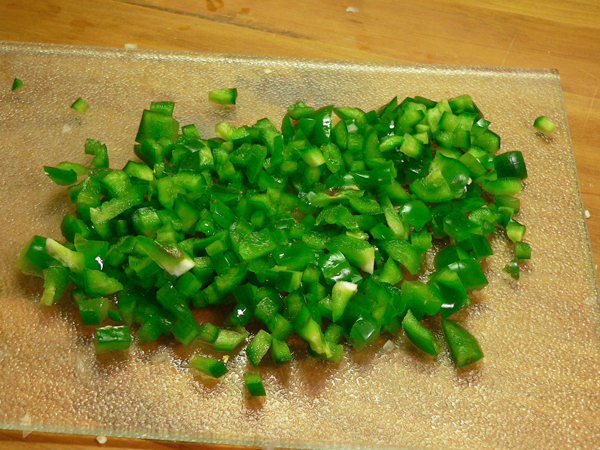 Dice the bell peppers into small pieces. 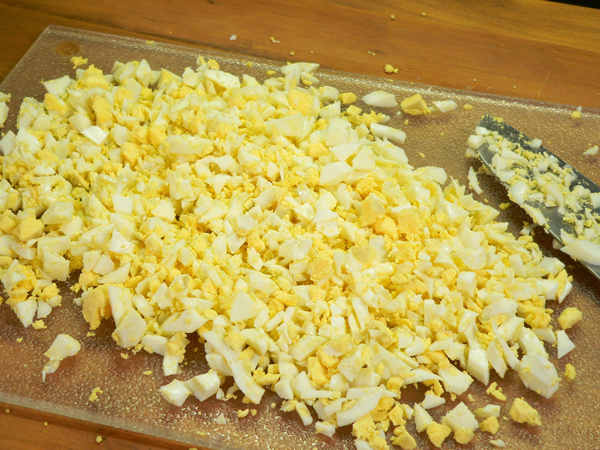 Chop the hard boiled eggs. I didn’t mention anything above about the eggs. I had already boiled these and peeled them the day before. Boiled and peeled eggs will keep in the refrigerator for up to a week, so this is one step you can do ahead of time if desired. Once the potatoes have cooled, add the bell peppers. 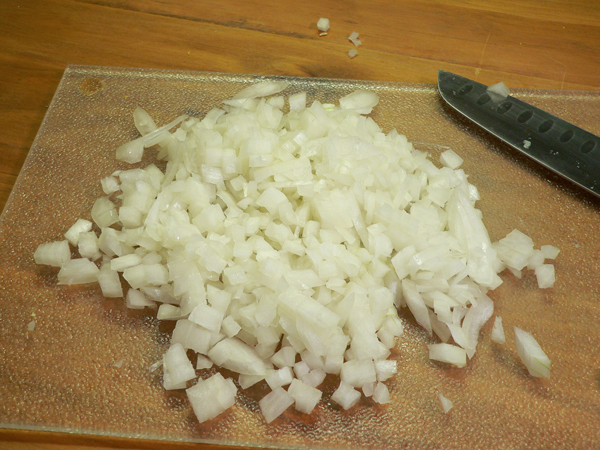 I ended up not using all the onions I had prepared. I thought it might be a little too much, and knew that I could easily add them later if I decided to do so. I’m using some of my homemade pickles. I cut them up, but probably should have chopped them a bit more before adding them. I also added some of the sweet pickle juice. Makes it even better. As with all the flavors we’re adding, it’s best to start out small and then add more once you have mixed everything together well. 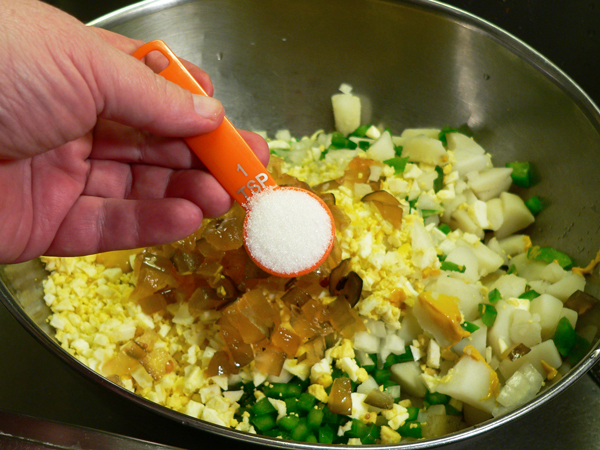 It’s much easier to add more salt or pepper, than it is to try to cover up or remove too much. You’ll want to make this YOUR recipe. Follow the basics, then adjust the flavors to suit your own tastes. Grab a large spoon, and dip down to the bottom of the bowl. 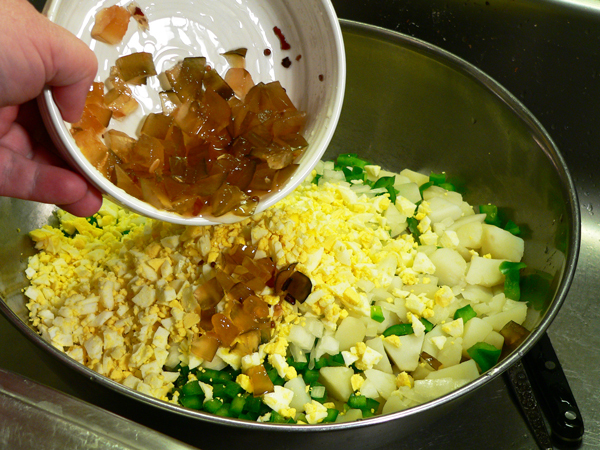 Bring the mixture up and fold the ingredients together gently. If you get too ambitious here, you’ll end up smashing the potatoes and end up with mashed potatoes instead of potato salad. Taste the potato salad at this point. When you’ve got it mixed, taste the potato salad and add more salt, mustard, relish, mayo or anything else you think it might need. Again, make it your own. Cover the bowl and place it back in the refrigerator for at least an hour, if possible, to let the flavors meld together. Big bowls of Potato Salad like this were common at Mama’s table. She’d make it almost every Sunday for dinner for the family and friends. By the way, this is only a part of what this recipe made. Just saying. 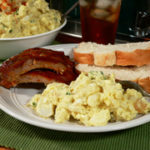 Any church function, dinner on the grounds, family reunion or picnic seemed to always include big bowls of potato salad. It’s one of my favorite dishes, and one of my fondest food memories. 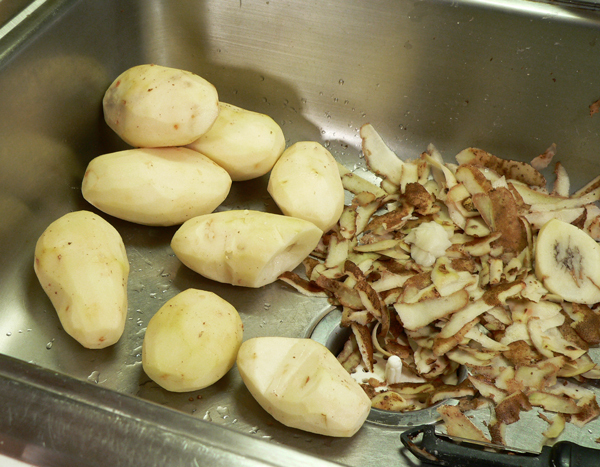 Wash, peel, and cube the potatoes. 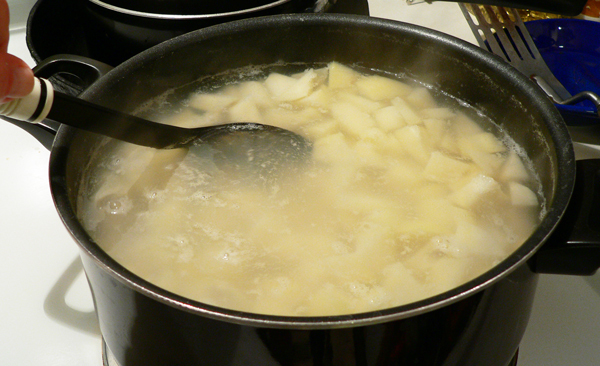 Place potatoes in boiling water, boil until tender. About 10 minutes. Drain the potatoes, place in large mixing bowl. Refrigerate while you prepare the veggies. 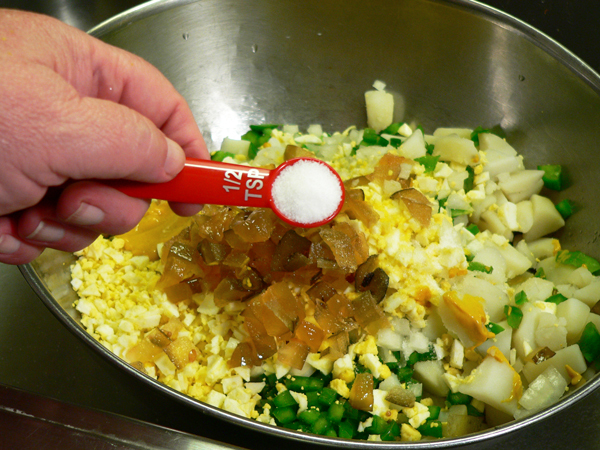 Add the bell pepper, onion, eggs, pickles. Add the mustard, sugar, salt, black pepper, and mayo. 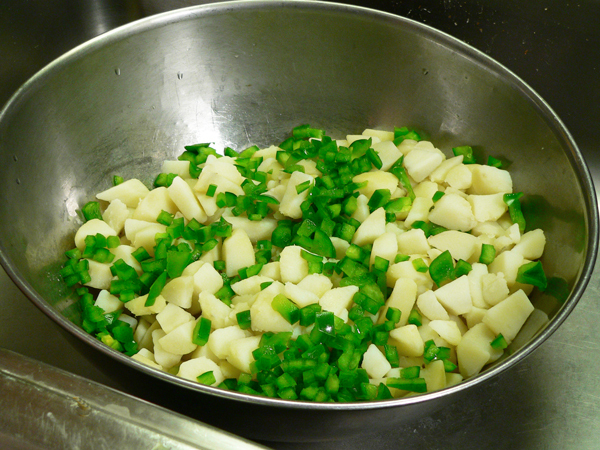 Gently stir everything together until potatoes are coated. Taste, add more salt and pepper as desired. Refrigerate for at least one hour before serving for best flavor. Your Comments: Ever made Potato Salad this way? I’d love to hear your thoughts on our recipe. It will only take a minute or two for you to leave your comments in the section below. I enjoy reading the commentary you include along with your clear and easy to understand recipes. Potato salad was one of the few recipes I sat still long enough as a young girl to learn how my mother made it, and for that, I am very grateful. She is still with us and cooking up a storm in her kitchen. Alas, she lives in Alabama and I have lived on the West coast for many years. I say “alas” because my mother is a little bit of this, and a little bit of that, and my personal favorite, “you know, honey, till it LOOKS right” kind of cook. Well, Mom, if it’s supposed to look gray and lumpy, then I’ve nailed it! Lol. Her/our version is very similar, but we boil the russets in their skins, peel them while they’re still warm, and incorporate the other ingredients at this time. 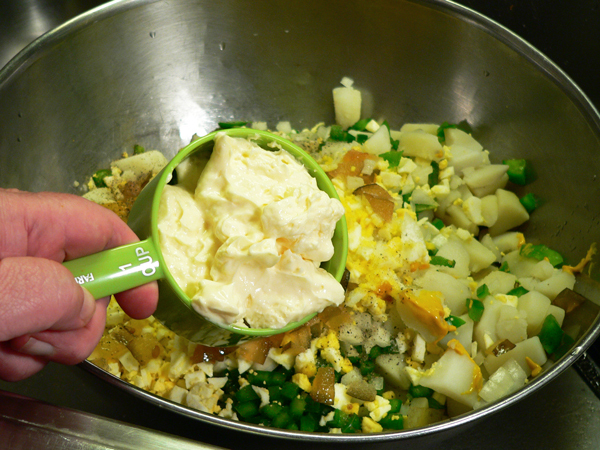 We feel the still-warm potatoes “soak” up that good ol’ Hellmann’s mayonnaise better this way. 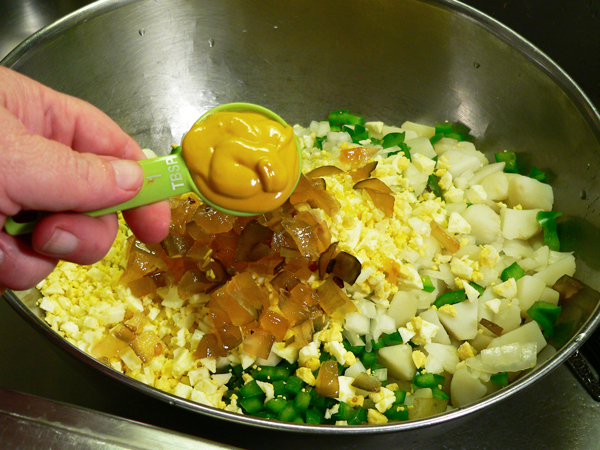 A little bit of prepared mustard, chopped onions, celery, and hard-boiled eggs, sweet pickle relish, S & P, and of course, diced pimento complete the dish. 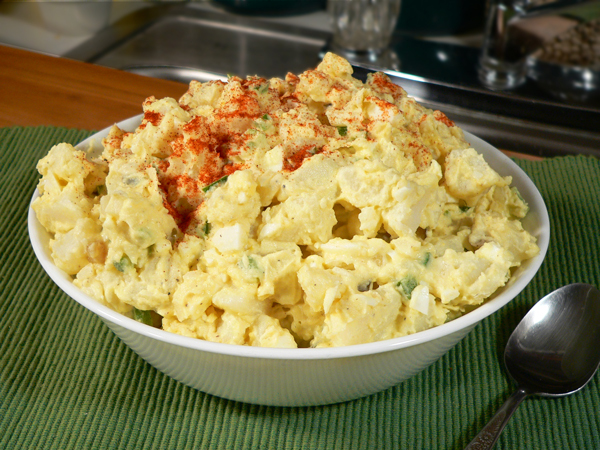 This potato salad is much requested and a favorite of mine. There isn’t a recipe on this site that I don’t love. I cherish them all. This recipe is no exception. Definitely reminds me of home in Mississippi when my grandma used to make it for dinner or other family functions. Tonight I made it for my family for Thanksgiving and they loved it. This is real southern cuisine. Thank you! Happy Thanksgiving! Great recipe!! Wish they had Dukes where I lived ! Just like my potato salad except I add a teaspoon of red wine vinegar and some celery seed. Love your recipes. I grew up in Alabama and my mother’s potato salad recipe was different from yours (though my MIL’s was similar to yours but she added chppped green olives). Mother used chopped dill pickles, dry mustard, onion, mayo and a splash of pickle juice. I sometimes add horseradish to mine. But never sweet pickles or bell pepper. If you want leftovers don’t let anyone know you made this potato salad. It will be “all gone”; all you will have left is an empty bowl! It is VERY GOOD! Thanks for sharing Steve. Keep your southern recipes coming! Now on to the banana pudding. Your recipe is like the one I was taught, no bell pepper or sugar, there was usually celery and often chopped black olives. I have made a similar potato salad for 60+ years. Sometimes I leave out the mustard, depending on who I’m cooking for, but I add chopped pimento. The pimento, I think, is an Alabama thing. The mustard seems to be a Northern version made by my Dad’s Mother. My Mother’s people from Tennessee never used mustard. Thanks so much!.That looks delicious. I like to add a little diced celery or celery salt too if I have any. Dukes is very good quality mayonnaise but I still enjoy JFG the most. It’s lighter and sweeter. It also seems hard to find West of the Mississippi . Hi. This potato salad is similar to what we ate in Arkansas when I was a kid, except for the bell pepper (don’t know why it was omitted). We also included celery for a little crunch and light taste. Today I use Bread and Butter Pickles, or even Dill pickles, depending on which is in the ‘frig. I prefer Dijon mustard but will use a little yellow mustard too. Also like to use a red onion for color and a milder taste. 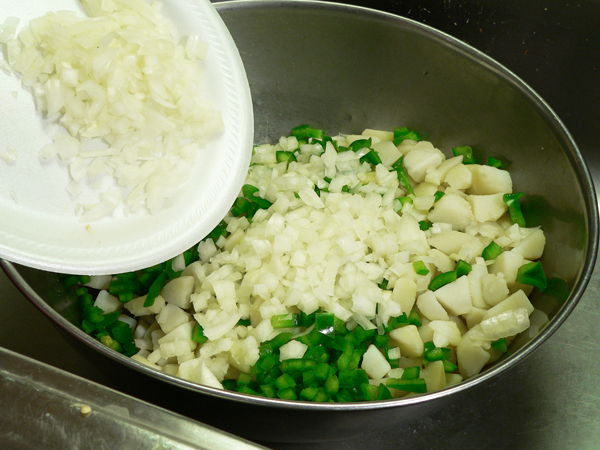 Have been known to slice some green onions, including the stems, for a little color. It’s better if it can sit in the ‘frig over night! May need to add a little more mayonnaise the next day. I have a question about the kind of potato you use. I have used red skin potatoes (peeled) and white potatoes, but I can’t tell by the picture what kind you have used. Russet or Idaho? I have never tried either one of those for fear they would fall apart. My potatoes have a tendency of getting too soft, so I love the way you start with the water already boiling, I have always put the potatoes in the water and heated it to a boil, and you can get very mixed results like that. Never have put green pepper in before, looks good, my mom used celery with onions and eggs. She didn’t put pickles but did use use mustard. I might give this a try on my family and see if they will like it as well as my mom’s version. Also, Lawry’s seasoned salt is a must. This is very similar to my potato salad. I use brown mustard and add a little bit of horseradish. Yummy!!!!! I will definitely try this potato salad recipe. Looks a lot like my mother’s recipe but she didn’t use bell peppers. Mama’s spaghetti recipe was as easy as they come and super delicious. She used Hunt’s tomato sauce and paste and along with seasonings like salt, pepper, onion, and garlic she always used Lawry’s Seasoned Salt. Well that looks really worth a try. My Daddy raised me till he died when I was 11 and then I went to my Momma’s to live. My Daddy was an old man when I was born but he made the best food I can recall tasting. His food was much like I see and have tried from your emails. He would’ve been 110 on the 9th of this month had he lived. He came from a generation that knew how to make anything delicious. I’ve never had certain things just like he prepared them and the taste was never there. I’m willing to bet this is the way he did his potato salad so I have to try it. Thanks for all the recipes and kind emails!! As always, you continue to provide my Monday morning “great news”…much better that any network or newspaper! 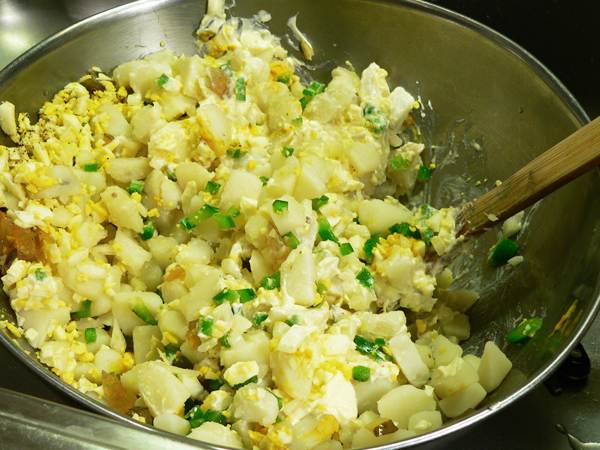 This recipe for potato salad is so very close to my late wife’s recipe. The only exception that I have been able to spot (or taste), is the addition of fine chopped celery, and the omission of the bell pepper (a digestion problem for both of us). Otherwise, you pretty well “nailed it”! Thanks so much for your weekly message of cheer and peacefulness…I always my pleasure.